Email overload is a reality. I am confident you get more emails than you want, more emails than you need, and more emails than you can handle. Indeed, each year we see study after study saying we are spending more and more time each day just handling emails. One statistic from two years ago reports that the average office worker spends just over four hours a day on email. Before we had to cope with masses of emails, business productivity increased at around 20% every decade. In the past ten years productivity has fallen. We are less productive in the office now than we were in 2008 when the amount of email we had to cope with was around 150 messages a day. Now it is more than double that. Plus it is rising at around 16% per year. The recent productivity rises in the UK are minuscule. They are less than 1% growth – and 1% of not much is not very much at all. Indeed, economists reckon that the tiny productivity gain the UK has seen is largely due to the changes in the exchange rate of the pound. However, it is unlikely that in your day-to-day work, the productivity statistics do not bother you. What concerns most people in the office is the vast amount of messages they have to read and answer. Email overload is the number-one issue facing most employees these days. So you need a plan in order to cope. 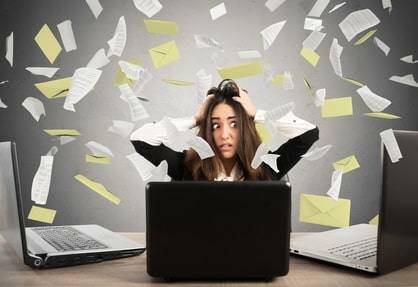 If you don’t have some kind of strategy to deal with email overload you will become stressed, and your work performance will fall, meaning it will take longer to deal with the ever-growing amount of email. This is a perfect negative spiral. Email overload has to be dealt with, urgently. Here are five ways you can reduce the impact of email on your daily work, which will cut the time taken to handle email and will help minimise the impact of email overload. However, an overriding issue is your attitude to email. You cannot implement these five methods if you think that doing so will affect what your boss thinks or that it will not work because you “have to” deal with email otherwise your job won’t get done. Indeed, it is this kind of thinking that is at the root of the problems with email overload. People make assumptions about how quickly they need to deal with email, they think that their colleagues will think less of them if they don’t reply immediately and they believe their bosses insist on email. None of that is ever really true; we just think it is. Changing our ideas about email and our perceptions about email is at the heart of handling the overload. Far too many people have more than one email address. That makes sense, of course. You need your primary work email address, perhaps a personal one too and maybe “special” email addresses for marketing and so on. You might have another that is linked to a social media account, and you could have further email addresses for particular logins. Multiple email addresses lead to problems, such as the need to log in to different services. However, the most significant drain on your productivity is psychological. That’s because you know you have multiple email addresses and your brain continually worries that you might not have checked one service or another. So you get subconscious signals to check your personal email or to have a look at those individual email addresses. This psychologically triggered checking behaviour wastes time. Plus it is a waste of mental energy, reducing your overall performance. The solution is one email address that gets everything forwarded to it. Gmail is an excellent option, but there are others including paid-for services such as FastMail. If your company is concerned about security issues with centralised email services then use something such as G Suite. You can connect all your existing email addresses to such systems. Plus you can send from those systems as though you were emailing from the original accounts, meaning you can retain your separate identities. Similarly, you can even send from the original email systems so that if any bosses are worried about audit trails or email tracking, you can use a webmail service to send directly from your company’s server, whilst using the same webmail service to send another message from a different originating server. If you combine all of this with the use of suitable filters, you can have all the email sent to your personal email address diverted to your personal folder inside Gmail, for example. At the same time, a filter for your work emails would direct all of those messages into a business folder while your social media email messages could be headed to another. One single email account with inputs from all your separate accounts and efficient filtering will save you time. Plus it will reduce the psychological issues associated with not knowing whether you have checked a particular email account. One of the reasons we have email overload is because people regularly check their email account. Or, worse, they have notifications switched on and are constantly interrupted by each incoming message. This way of using email has two main psychological impacts. Because email is seen as an “anytime” activity, your brain does not know when it will get its next “fix”. Consequently, it is always “on edge” wondering whether an email has arrived or whether you need to reply to something. This leads to constant checking, “just in case”. A second psychological issue is the impact of interruptions. When you get a notification or alert that an email has arrived you stop work for what seems like a few seconds, just to check the message. Even if all you do is look at the notification and decide not to deal with the email, your brain is prevented from thinking about the task you were doing before the notification popped up. It can take about two minutes to get back to the task after reading a notification. If, though, you click on the notification and read the email, the time it takes to get back to work is around 20-minutes. This is due to the phenomenon of “attention shift”. Your brain has to change its focus, so it forgets what you were doing before the email and concentrates on the message. But then you are asking your brain to get back all the information it had retained for the task once you have dealt with the email. That requires considerably more mental effort than you might think. Going backwards and forwards between tasks and emails is taking at least an hour a day of “downtime” making you much less productive and more inefficient. The answer is to schedule your use of email. Switch off notifications and alerts, close down your email programme or webmail window, and only check your email at specific, timetabled times of the day. One mathematical analysis of email usage showed that checking emails between two and four times a day was the most productive. Another piece of research found that checking emails a maximum of three times a day led to a significant drop in stress levels. When you are less stressed, it is well-established that your performance rises. One of the main problems with much email use is that people are repetitively typing the same things over and over again. That just wastes time. Using templates or text expansion programs will save you hours each week. You can store templates inside many email client programs and just insert them into a blank email. If you use Gmail, then you can use Gmelius to save a wide variety of templates and inject them with a couple of clicks. However, templates are most useful when you have to make completely standard replies. What if you need to produce an individual response but end up using phrases and sentences that are regularly used. The answer, in that case, is to get PhraseExpander. This is the most efficient method of text expansion that you can find. For instance, I often have to type the following sentence in emails I send to people when I have been asked to review their website: “One of the things I noticed was that your contact page only has your phone number and office address. You could add other methods of contacting you here, such as direct messaging on Twitter or through your Facebook page.” I have to type that a lot…! Except I don’t; I just hit three keys, press “tab” and PhraseExpander inserts the whole sentence. PhraseExpander also corrects mistyping of thousands of easily misspelt words and makes the insertion of symbols, such as the Euro (€) without you having to remember fancy combinations. It is estimated that the typical office computer user can save more than 90-minutes per day when using text expansion systems like this. One problem with email is repetitively typing the same things over and over again. That wastes time. Using templates or text expansion programs will save you hours. One of the issues when handling email on an “ad-hoc” basis is that all the replies also come in randomly. That means your working time is interrupted, you are expected to deal with messages “whenever” and your psychological state is changed depending on the tone and nature of the emails you read. The time you send emails dictates the time you get replies. That’s because most people are dealing with emails immediately. In turn, this means when you send out a message you are going to get a response when you have stopped using email and are in the midst of a task. The answer to this is to schedule the timing of your emails so that the responses you get will be most likely to arrive at the times you want them to come back to you – when you are dealing with email. Hence, if you deal with email twice a day, you might want to respond to emails in the morning but schedule them to go out an hour or so before your second email slot in the afternoon. That way the replies will be most likely to arrive when you are in email mode. You can quickly schedule the sending of emails within programs like Outlook. If you use webmail, then RightInbox can help. If you use Gmail, then the answer is to get Gmelius to schedule email sending times. Your email signature is a great way to ensure you get people to deal with your emails in the way you want and avoid further email overload. Most email signatures just have a “Kind Regards” sign-off together with some contact details. However, do you want everyone to contact you in the same way? Also, would it be better for them to visit a specific web page to follow-up on your email conversation? If you have multiple email signatures with different elements according to what you want to the recipient to do, then you are in much more control of the impact of your emails and your resulting workload. Programs like Outlook and Gmail do allow multiple signatures, but they are dependent upon the specific email address from which you are sending. The chances are that you want several different sign-offs even for the same email address. One way of dealing with that is to sign up for Wisestamp. This allows you to set up multiple email signatures which you can then easily insert into Gmail or Outlook. It also works on every device, so if you use your mobile for emails then you can also insert any signature depending upon the specific circumstances. When you use multiple signatures it means you can get people to phone you (or not), to check FAQs (or not) or to reply using an online form (or not). In other words, you can prompt people into dealing with your email in specific ways which are most useful to your productivity. Using these five methods can significantly reduce the time it takes to handle email, giving you more time to work more efficiently and with less stress, thereby cutting out email overload. But one final thing – this will not achieve “inbox zero” but it will make your email more manageable.